With the summer holidays well under way, keeping the children occupied can be an ordeal. Not only do you face the issue of getting them from in front of the TV and outside, but there’s also the cost involved in taking part in the many activities and events that are taking place across Barrow and Furness and beyond. One other factor, that’s often ignored, is that you have to feed the children while they’re off school. If your child normally receives free school lunches, then being in the position where you’ve got to find the money to make sure they eat properly can be a massive deal. That’s where Brunch Club can help. 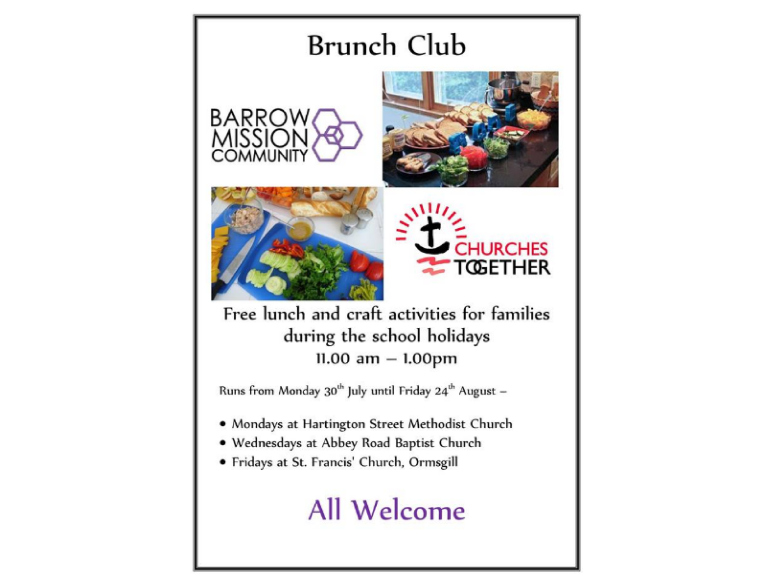 You and the children can enjoy free lunch and craft activities throughout the school holidays at different churches in Barrow. The scheme runs from Monday 30th July through to Friday 24th August. So where does it take place? So get involved and take some of the stress away this summer. There’s fun, food, activities and friendship to be enjoyed! All are welcome!